This Rapid Blog comes to us from David Koning, who teaches at the nature-based STREAM School in Hamilton, MI, where he prefers teaching in Carhartt double fronts paired with Chaco sandals or muck boots. He is happy to say that as of this summer, he has officially taught every single grade level — from first grade through college senior — in his 25 years as an educator. David lives in Grand Rapids. This essay is his own and does not necessarily reflect the views of Rapid Growth or its parent company, Issue Media Group. 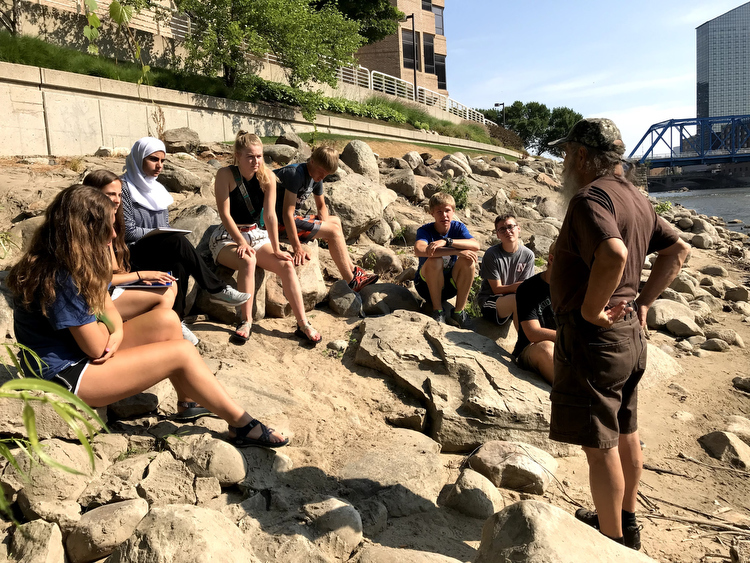 In this Rapid Blog, local teacher David Koning explores Grand Rapids WhiteWater’s Little Mussel, Big City: Summer Science and Leadership program that connects high schoolers with the Grand River. 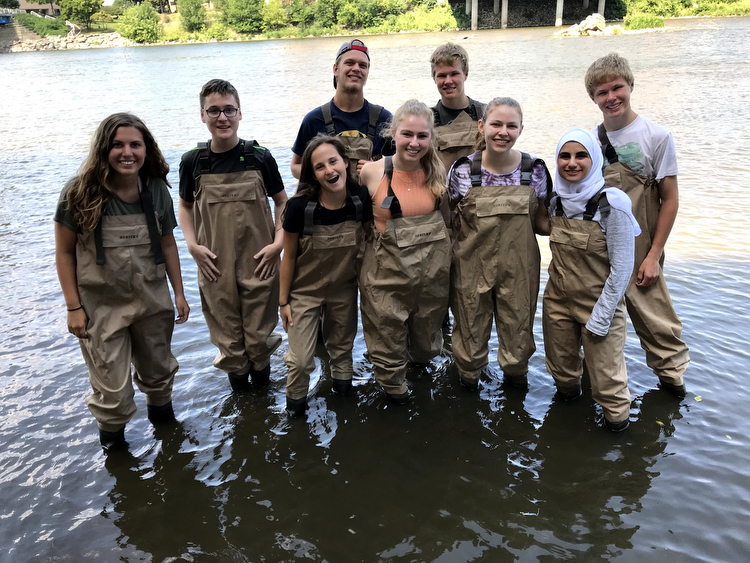 Anyone donning a pair of fishing waders has automatically made some concessions to fashion and personal presentation, but the nine area high school juniors and seniors gathered at Riverside Park this past July didn’t seem overly concerned with style points — their eyes were all fixed on the Grand River. 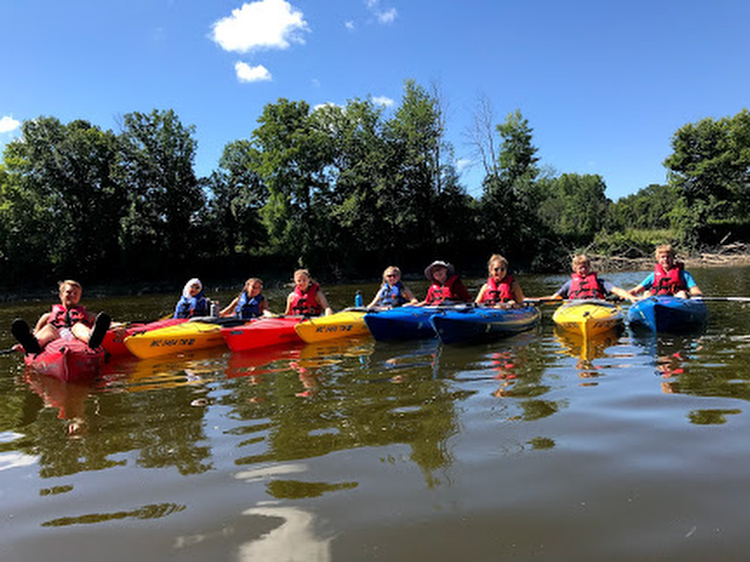 Each one had been selected to be part of Grand Rapids WhiteWater’s Little Mussel, Big City: Summer Science and Leadership program. The river restoration project began a few years ago as a creative, perhaps even playful, idea to create a downtown whitewater park for kayakers and surfers. Like many things in life, the proposal soon grew complicated. A lot more complicated. The Grand River is both metaphorically and literally the heart of the city, and its complex history of people, economy, and nature converged like a Class IV rapid. In the past, the three were often seen in opposition or at best as a series of compromises. Better thinking sees all three as puzzle pieces to be fit together. As we rush forward in the 21st century, the problems inherent in what might be coined conquering capitalism — a system that emerged at a time when overpopulation and global-sized environmental threats were inconceivable — are at a tipping point. What actions the adult world takes now are certainly of critical importance. But it is perhaps even more important that we enable young people the opportunity to build something new: a worldview that embraces progress and growth alongside, not in spite of, social and environmental factors. And so the students, strangers to each other until just the day before, stood on the banks of the Grand, huddled in a tight group ready to take a much smaller step toward saving the world: looking for federally-endangered snuffbox mussels. We were with one of the nation’s leading experts, Heidi Dunn, who explained how non-invasive freshwater mussels are keystone species that, when present, are significant indicators of healthy river ecosystems. Boundaries staked, students entered the river on hands and knees, catch bags looped over shoulders, running gloved hands through the sandy river bottom. Each day, students gathered at our home base at the Grand Rapids Public Museum, a perfect riverside basecamp for our daily excursions. In the two weeks we spent together, students manipulated physical and digital watershed models, measured and marked fish with GVSU grad students, learned of the native Anishinaabe history and relationship to the river, explored the history of sturgeon, met local business leaders and city planners, paddled kayaks, and held a mini-session in design thinking. Walking up to four miles a day, we also made time for ice cream. Their work culminated in a creative ideas workshop, emerging from what they’d learned about the many layers involved in the river restoration project. Proudly, they shared their ideas before the mayor and the city commission on their final day together. Place-based learning, that which takes students out of the classroom and connects curriculum to the larger world, is the most powerful gateway I know to foster deep learning and allow students to connect to something larger than themselves. In a more relaxed environment coupled with hands-on learning, there is actually more room for growth, creativity, and productivity. After the program, students testified that “we learned to work as a real team.” Meeting community professionals (all of whom testified that their journey had been an adventure full of surprises rather than a fixed path), one student remarked, “I grew in my view of my future. I’m now considering a lot more things I can do that would interest me.” And if nothing else, “I also learned how to talk to adults and how to have a good handshake!” Students closed the program considering ways they could stay involved with the river and the river restoration project: helping with youth programs, volunteering, serving as ambassadors to their schools, and even forming a youth branch of GR WhiteWater. Back in the water, bags were filling with mussels. These little creatures have served important historical, economic, and ecological roles from the time Native Americans first settled along a the not-so-quiet roar of whitewater rapids immediately upstream from where the public museum now stands. On this day, 16- and 17-year olds first name, measure, and then take a brief moment to marvel at each shell’s individual markings and color before properly returning it to the river. In their eyes, though, is the start of a new chapter of leadership and vision marked with intelligence and passion. In their hands is the future itself. The Grand River is more beautiful and healthier now than any other point in modern history. With the help of these students, and the many others in their generation and the generations to come, we can have hope that the river — and this city — will be even better 100 years from now. Grand Rapids WhiteWater plans to run another session of Little Mussel, Big City (and perhaps two) next summer. Look for information in schools, social media, or at the GRWW homepage (grandrapidswhitewater.org) after the new year. Photos courtesy of David Koning.